We had no great hopes of the meeting on Thursday but it turned out a really lovely day. It was a window in the cold, grey days of late November, mild and not too damp and we were six recorders eager to go. As usual we collected a number of ruderal records as we left the cars but then we reached the Open Access moorland where Paul and Andrew veered off towards an interesting-looking wet patch and immediately saw Rhynchospora alba, White Beak-sedge, and Vaccinium oxycoccus, Cranberry. There was also a tiny stem of Menyanthes trifolia, Bogbean, [what else could it be?] and an equally minute piece of Drosera rotundifolia, Sundew. We followed an old drover's road towards the "Roman Practice Camp" marked on the OS map at Dolddinas - I wish we had done our homework, as the Snowdonia National Park [SNP] website says: "This group of practice camps, about two miles south of Tomen y Mur, is among the best preserved in Britain." The work of investigating the site by aerial photography has been done relatively recently and has exposed the extent of Roman activity in the whole area around Trawsfynydd. Sadly, we didn't appreciate this importance as we ate our lunch - we simply noted the outline of one of the camps on the ground! The extensive wet moorland of the Migneint is straddled by huge pylons carrying electricity for the National Grid and a new road has been created across the moorland to enable the re-cabling of the network. We picked up this road after lunch to reach some abandoned mine-workings where we were very pleased to find three Clubmosses, Lycopodium clavatum, Stag's-horn, Huperzia selago, Fir and Diphiastrum alpinum, Alpine Clubmoss. The Fir Clubmoss was so small that I wondered at first if it could be a diminutive L clavatum. A reminder from "Poland" that L clavatum has very long [4mm] hair tips to the leaves was enough to confirm that we had both species. With a flurry of roadside records from the indefatigable Mari as we returned to the cars at the end of a long day, we made the grand total of 134 records - a most satisfactory meeting. 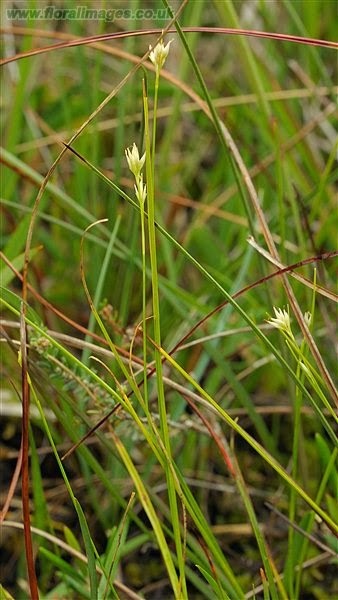 We are sure that there would be more records to come during the summer months - for instance a previous record for the tetrad, Carex magellanica, Tall Bog-sedge, would not be easily found outside its flowering time. Maybe it would be a good target for Caerdeon in August next year?